We have developed the Address Autocomplete by Google add-on that helps your customers quickly fill in the shipping and billing address at checkout. Use our add-on for easy integration with Google Maps API features. Once you have installed the Google Autocomplete add-on you can easily enable the address autocomplete feature on the special checkout field in your store. It will save time and prevent typing errors. — Simplify the checkout process by offering address autocomplete. — Add a Quick address search field based on Google Places API to your checkout page. 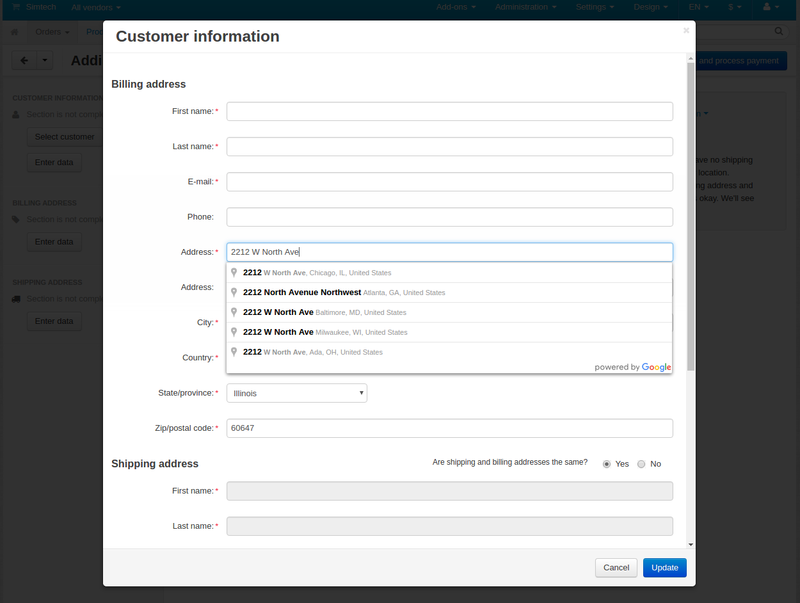 — Allow your customers automatically fill in the address form fields, such as address 1, city, region/state and postal code. — Avoid customers’ typing errors. — Improve the website usability and enhance user experience. If you enable the “Show a bar for quick location search” setting on the settings page, your customers will see a new field for quick address search above the address field on the checkout page. When a user starts typing an address, autocomplete will fill in the rest. That’s all! This simple and easy to use extension will help you to improve customer experience. The add-on is compatible with CS-Cart and Multi-Vendor 4.3.5 and above. Need compatibility with another CS-Cart version? Contact us now. Thats nice and all. But a couple people has already made this addon. How about working on addons that no one has made yet, such as eBay addon that actually has features unlike the current one you guys have? We are open for new ideas. If you know some features that many people need, just contact me and we will discuss it. What about eBay, please let me know what features you mean. Easy answer for the eBay addon....pretty much everything. Basic functionality for starters. Such as removing inventory from store if item is sold in the store and have it canceling ebay auction at the same time, without having to go in and manually do everything everytime something sells, as well as being able to sell outside of whatever countries ebay site you are listing on. Need international shipping. With the addon the way it is now, you are basically cutting out the entire worlds worth of sales except for whatever country you are located in. As far as I understand, you want totally synchronize the product inventory in your store with eBay. But what do you mean by "Need international shipping"? Currently with cscart if you want to export products to ebay.com you must have $ as base store currency and you can mail only locally that means to US not to worldwide (it is cscart limitation not ebay). Now if you are from Europe you cannot do any of those..
PS bought the autocomplete addon, works very well! I think you should explain better in description of addon that additional search field is optional that can be enabled or disabled. For example I do not want this extra field.. Thank you for your feedback. We are glad to hear that everything is working properly. What about eBay, we will look into this more carefully, possibly, we manage to find some solution. Great add-on, but it will confuse customers, why to use 2 boxes for filling address and indicating that one of them is specificly 'Quick address search'? customers will skip this becuase they don't need to search their address, they just need to fill it directly in the 'address' box, assume that a customer is filling the 'address' box (and the auto address complete is configured to the 'address' box), if their address is listed then they click on it and the add-on is auto-filling the rest (country, city, etc. ), there is no need for 2 boxes for the same thing, keep it simple. In case that the address isn't listed, then the customer will proceed the old fashion way, filling manualy, but at the same box. What about connecting Cs-Cart to Payoneer payment system? they have both regular and escrow payment system that works with over 140 countries, more than any other payment add-on that you made so far. Another Importent (very importent) thing for me is to enable Cs-Cart's Facebook store add-on to vendors in case of multi-vendor system, i.e. every vendor will have the ability to publish at his/hers Facebook page only the products they are selling on the marketplace becuase it doesn't make sense that one vendor will promote other vendor on his/her expense. The store owner already can show the entire store via Facebook Add-on. Vendors should have the ability to show only their products via Facebook Add-on. You can disable the "Show a bar for quick location search" in the add-on settings, and the "Quick address search" field will not be shown. I can offer you the Braintree Marketplace, Stripe Connect and PayPal Adaptive add-ons. All of them allow you to automatically divide money between vendors. Braintree Marketplace add-on also offers escrow and refund systems. Could you please clarify what add-on you talk about? We did not finish our testing and adaptation yet. I will let you know when the new version is ready. I've PayPal Adaptive becuase I want to distribute the money among vendors automaticly (which I think must be build-in into multi-vendor version, or at least an option), but PayPal doesn't offer escrow system, Braintree and Strip doesn't work in my country, btw Payoneer working with Amazon which no other payment system can say and it's a major name dropping. Let me know if you understand. I will discuss the integration of Payoneer and modification of Facebook App with our managers. Thank you. sd_google_autocomplete_address Version 4.3.5.3 causes JS error, breaks facebook app from loading.. Order improvements addon does same.. I am sorry you face such issue. We are working on it now. We will test our add-ons better. We have added the address autocomplete in the admin panel. There is an update for Multi-Vendor store owners! Now the address autocomplete by Google is working on the apply for vendor page.